Walmart offers the Sony Playstation 4 DualShock 4 for $39. 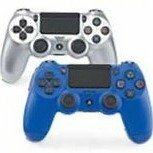 Features: The DUALSHOCK 4 wireless controller offers improved analog sticks and trigger buttons with enhanced vibration, and also adds new features such as the multi-touch, clickable touch pad, integrated light bar, and internal speaker. Players will get the ultimate control for all games on PlayStation 4. The Share Button lets players celebrate and upload their greatest gaming moments on PlayStation 4 with the touch of a button.